AVAO PREMIER ISLANDS RESORT COMMUNITY - The ultimate leisure and recreational destination. 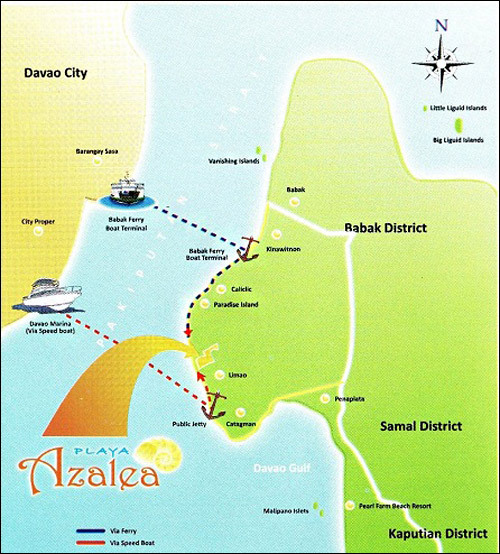 Playa Azalea, a world-class leisure destination is a development geared towards the destination of davao, the "City of Bloom" into a fully enlivened site of exceptionally exuberant lifestyle. Homeowners and guests will take pleasure in the developments’ engaging range of indoor and outdoor attractions that will indeed make Davao most favoured beach destination truly a world-class lifestyle hub. A 33-hectares master planned community set in a lush tropical islands featuring exclusive high-end residential and commercial enclaves. Your very own gateway to a private retreat. A few minutes away - It is just 4 kilometers away from Babak Ferry Boat Terminal and a 5 minutes away from Davao City by speed boat. Savor the privacy and the luxury of being in an exclusive seaside residential community blessed with a 400 meters beachfront of white sand. Its water provide a safe and suitable environment for water-based activities. Playa Azalea’s private white sand beach is safe and suitable for wading and swimming as it is naturally blessed with a gradually sloping seafloor. Located right at Samal Island, the Asian-Tropical themed paradise will definitely be the City’s newest and most prestigious landmark where your family can enjoy and relax Samal Island’s white sand beach, the views of Davao Gulf, Davao City, and Mount Apo, or indulge in nature-inspired outdoor activities. 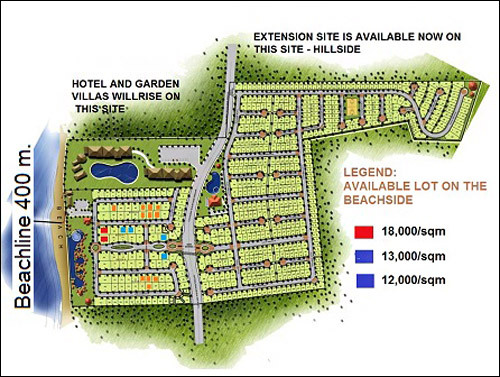 Residential site is setting in a solid rocky limestone soil along a ridgeline overlooking elevation, offering an unobstructed views of the sea, Davao skyline and infinity Pool overlooking the sea. Envisioned to be the center of leisure, tourism, and social activities of Samal Island and Davao Region. Scenically set a few meters away from the beach. RED = PHP 18,000/sq.m. ORANGE = PHP 8,500/sq.m. BLUE = PHP 13,000/sq.m. SKY BLUE = PHP 5,800/sq.m. ORANGE = PHP 12,000/sq.m. VIOLET = PHP 6,100/sq.m.